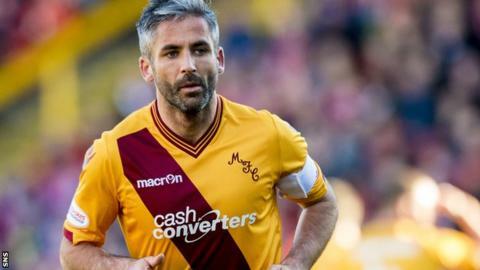 Keith Lasley says he hopes last season's experience of the relegation play-offs will help Motherwell avoid being sucked into another battle against the drop this term. Well dropped to 11th in the league after defeat at Ross County. "The experienced players we've got in the dressing room was a big factor in getting through the play-off matches last year," Lasley said. "It ended well but not an experience I'd like to go through again." Motherwell captain Lasley has been absent in recent weeks through injury but is ready to return against Hearts on Saturday. The Steelmen have won only one of their last six matches but are only five points off a top-six position. "We certainly feel that, when you see how tight the league is, one or two results and you can be up there fighting for sixth place rather than 11th," Lasley said. "But we know we need to get those results sooner rather than later. "We've got a good home game against Hearts, it's a big occasion and that's an opportunity to start the ball rolling." A calf injury has kept Lasley sidelined for the past month. His last first-team appearance was against Aberdeen in the 1-1 draw at Pittodrie on 24 October. Lasley has been assisting under-20s manager Stephen Craigan this season in coaching the club's youngsters. But this week the 35-year-old midfielder played for the team, along with fellow veterans Stevie Hammell and David Clarkson against Hibernian, to aid his recovery to full fitness. "I got some football there, although it was more of a Masters team rather than an Under 20s team," he joked. "I was probably just about fit for the Ross County game last week but not quite 100%, so this Saturday I should be available. "Coaching is a side of the game that interests me in terms of my long-term future. "It's been good learning the other side of the game and appreciating the manager shouting at you from the side. "I can relate to those emotions now and the frustrations at times. "But it's been great helping Stephen Craigan working with the youngsters and hopefully I can help develop them into the first team." Lasley is one of three experienced players ready for a first-team return against Hearts. Hammell, who has been sidelined with a groin injury since September, is fit again, while defender Stephen McManus is available after suspension.